Our August issue has two Las Vegas blackjack reports: one on the El Cortez casino (by Stu D. Hoss), and the other on the Aliante and Cannery casinos (by KC Brooks). (There are some good blackjack games in these casinos.) I get asked a lot blackjack questions; this month I'll reveal the ones that I get asked the most often (with answers, of course). If you want to know what were the four techniques that the MIT blackjack team used to beat the casinos, read former MIT team member Nicholas Colon's article. If you want to learn some techniques on how to rat-hole your chips to give the perception that you are a loser (or won less) playing blackjack, check out the tips in Paul Wilson's article. I've been asked several questions about no-hole blackjack games so I decided to include an article about it in this issue of BJI. 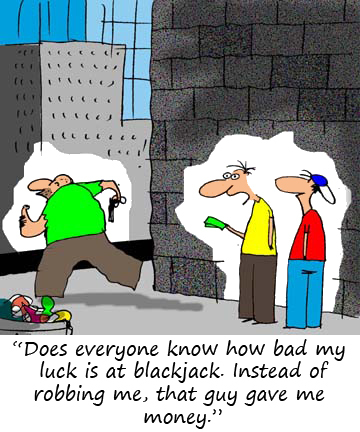 My friend, attorney, and author Robert Loeb offers his perspective on the (21) reasons for the decline of advantage play blackjack. One of the newer video poker games is Ultimate X; Jerry "Stickman" explains how the game is played and what strategy you should use to play it. In this month's Casino Answerman column, John Grochowski answers some interesting questions dealing with games that win less often because they win more money; the house edge on mini-roulette; and the odds of two successive blackjack hands and two successive three-of-a- kind hands playing Three Card Poker. Copyright ©2017, Jerry King, www.jerryking.com. All rights reserved. E-mail subscribers can also read each month's issue online at our web site. This article by the late Vinny DeCarlo offers tips (some controversial) on how card counters can increase their chances of winning. The article appeared in issue #125 of BJI. To read it, click here. "I have played at the El Cortez on occasion over the years and should probably play there more often because..."
"Aliante has always been one of my favorite casinos to play because..."
"How many questions do I get on blackjack? Glad you asked. I figure about five a month, on average, so that's 60 a year, or roughly 2700 over the past 45 years that I've been a blackjack writer (whew). And what were the most asked questions? Here they are, slightly paraphrased, and in no particular order..."
"Now let's take a look at each of the four methods actually used by the MIT teams in live casino play. The most visible technique for the MIT teams was the..."
"I've written in the past about how to look like a loser. This month I'm going to discuss a particular technique that will help you do just that..."
"In many casinos outside the U.S., the dealer does not take her second card until after all the players have completed their hands. This is known as the..."
"It's appropriate to take a step back and look at the historical path the game has taken in the last twenty-one years. So here is a list of 21 of factors that have contributed to a decline in the quality of the game..."
STICKMAN'S STANCE: ULTIMATE X POKER by Jerry "Stickman"
"I will examine Ultimate X Video Poker and summarize the game's strengths and weaknesses, pluses and minuses..."
"John Grochowski answers readers' questions dealing with games that win less often because they win more money; the house edge on mini-roulette; and the odds of two successive blackjack hands and two successive three-of-a- kind hands playing Three Card Poker..."